Diarrhoea? Constipation? Flatulence? Intestinal Dysfunction? Immature Digestive System? IS YOUR PET GETTING ENOUGH GOOD BACTERIA? 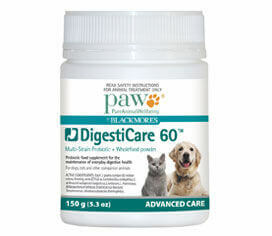 PAW DigestiCare 60™ is a multi-strain, multi-species probiotic and wholefood powder for the maintenance of everyday digestive health of dogs, cats and other companion animals. - Provide good bacteria to restore and improve intestinal balance. - Aid during period of intestinal dysfunction, including treatment and control of diarrhoea. - Exclude and suppress bad bacteria such as E.coli and Salmonella. - Aid in the establishment of gastrointestinal microflora of physiologically immature animals (puppies & kittens). - Deliver essential amino and fatty acids, key vitamins and minerals. 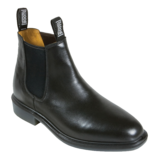 - Suitable for dogs, cats and other companion animal. - Each 2 grams dose contains 60 Million CFU of 'good bacteria'. - Highly palatable powder that can easily be sprinkled onto your pet's food. - Includes a 4 g measuring scoop for an easy usage.